A blend of several forms of creatine with different absorption kinetics and the matrix pomperów and transporters. With this combination, the results of your strength and growth will be significantly accelerated. The enormous pump effect of training! NEW FORMULA WITHOUT CAFFEINE! 1 loyalty point Your cart will total 1 point that can be converted into a voucher of 0,04 PLN. NEW FORMULA - CONTAINS NO CAFFEINE! Activlab Crea Shot 2.0 is a classic product of proven effect. If you are looking przedtreningówki, which has been tested by thousands of bodybuilders and still gaining followers - reach for the supplement. Perfect solubility and refined taste are unquestionable advantages Crea Shot 2.0. You will not be disappointed! 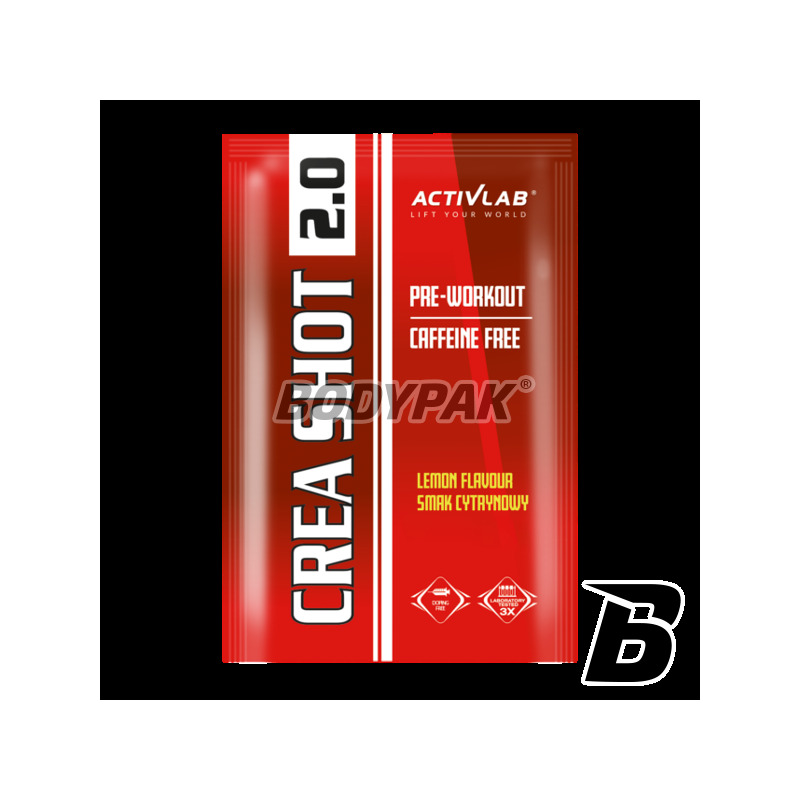 Activlab Crea Shot 2.0 is a product recommended for use before weight training and endurance. It is a combination of several forms of creatine, beta-alanine, arginine, glutamine, B vitamins and electrolytes. Consumption of creatine increases physical performance during short-term, repetitive exercise at high intensity. Beta-Alanine is a component of the dipeptide carnosine, beta-alanine delaying the occurrence of fatigue allows extra time for training. Arginine is an amino acid that meets the body's many biochemical functions, including is a precursor to release nitric oxide (NO). One of the roles it plays NO in the body, is to participate in vasodilation. One portion (20 g) in 250 ml of water. Use before a workout. Ingredients: beta alanine, creatine monohydrate, acidity regulators citric acid, trisodium citrate and tripotassium citrate, malate citrulline, L-arginine ethyl ester, creatine malate, L-glutamine, L-tyrosine, taurine, tricalcium phosphate, anti-caking agent silicon dioxide, potassium chloride, magnesium carbonate, emulsifier: disodium diphosphate, flavorings, inositol, sweeteners E951 and E950, vitamins (thiamine mononitrate, riboflavin, nicotinic acid, pantothenate wiapnia, pyridoxine hydrochloride, d-biotin, folic acid, cyanocobalamin ), colors: yellow and orange cochineal red A.
Sunset Yellow and Ponceau A - can have a detrimental effect on activity and attention in children. Cena okej, smak również niczego sobie. Polecam. Spróbowałem kilka saszetek i już kupuje duże opakowanie, bo produkt jest po prostu kompletny, nie może być inaczej jak 5/5! Advanced Creatine Mix + transporters, contains up to 11 modern components contributing to the increase in strength, power and improve recovery! Effectively improve your athletic performance! Advanced product based on creatine monohydrate high quality, which ensures very high strength and durable anabolic gain in muscle mass. It also supports a powerful pump on training, which will make you will not be able to complete the exercise! Nutrend Creatine Ethyl Ester - 120 kaps. A modern, stable and maximally utilized by the body form of creatine. In comparison with the classical creatine comes to achieve a similar effect with smaller dose by half. Olimp Creatine 1000 Creapure - 300 tabl. High-quality creatine monohydrate tablets. Certified quality CREAPURE! The extraordinary strength anabolic in every serving! Pure creatine monohydrate in powder form, which is widely used by athletes in the world. Highly anabolic and 100% legal preparation for the fast growth of lean muscle tissue! If you work hard in the gym and you care about the growth of muscle mass and strength, it will also need a healthy dose of creatine! High-quality preparation for a sensational price! Convenient form of tablets.